Purpura is a skin rash usually characterized by small, purplish-red spots on skin. There are different types of purpura, and they can be signified by slight differences in color, location, and longevity. Generally speaking, spots are four to 10 millimeters in diameter—like a pinpoint—and cluster in a concentrated area. Purpura rashes are unique in a few ways. The first is that, while they can appear as a rash, they don’t always itch or cause irritation. Secondly, when touched, they may not change colors. Lastly, these rashes may bare a closer resemblance to a bruise than a rash. One of the most important things to know about purpura rashes is that they are not an independent condition, but rather a symptom of another health issue. Because of this, it’s very important to have these rashes examined by a doctor. Some purpura causes are relatively minor, while other times, the rash may signal a life-threatening condition. Purpura symptoms can also differ by variety. One type of purpura is a thrombocytopenic purpura, which means it results from low blood platelet counts. This type of purpura diagnosis indicates there is a more severe health issue at play. Rashes or bruising appearing from low platelet (thrombocyte) count suggests internal bleeding, bruising, and undoubtedly, a lack of production of platelets. It can also highlight an issue that is limiting the platelets’ ability to circulate. This is a very rare form of thrombocytopenic purpura where blood clots form in small blood vessels throughout the body. It can be quite dangerous because of the potential to cut off oxygen-rich blood from vital organs like your brain, kidneys, and heart. The clotting also leads to increased platelet use, leaving the body susceptible to internal bleeding. A condition called hemolytic anemia can also arise, which is marked by an accelerated division of red blood cells. The blood cells cannot be replaced fast enough, leading to a deficiency. 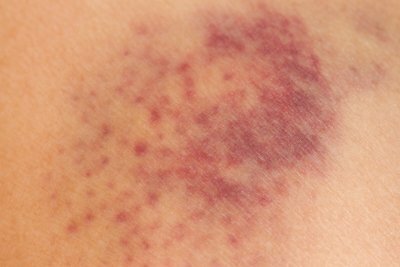 Excessive bruising and bleeding—bruises often appearing from internal bleeding—are the most common purpura symptoms of ITP. This typically happens from a severely low level of blood platelets caused by the immune system attacking itself. It can occur in both children and adults; however, in children, it usually follows a viral infection, like the measles or mumps. In adults, it can be recurring and not necessarily connected to an earlier infection. “Idiopathic” means “unknown cause.” Therefore, a doctor’s main concern is to stop the immune system from attacking itself and destroying platelets. Next, they will try to determine why the body is responding in such a manner. It’s also entirely possible that you will experience no symptoms with ITP. Non-thrombocytopenic purpura is when blood platelet levels remain normal but rashes still occur. There are a couple of varieties of this type of purpura, and there can be a range of causes. This form of purpura is essentially due to the fragility of blood vessels in old age. As you get a little older, you may find yourself bruising easier than you used to. It could be a result of inadequate nutrition or simply time taking its toll. It’s not something to be overly concerned about and is likely not a signal of any severe underlying causes. About 10% of people over age 50 acquire senile purpura symptoms, making it a relatively common condition. Large, purplish-red bruises. Generally on the backs of hands or forearms. This form of purpura is more commonly known as Henoch-Schonlein purpura (HSP) and predominantly affects children. It occurs when small blood vessels become inflamed and leak blood to cause rashes. HSP may be a response to a viral or bacterial infection, but ultimately there is no consensus on the cause. Spots on skin caused by purpura can be relatively easy to distinguish from other rashes. Shape, color, and the fact that they typically don’t lead to dry skin and itchiness make purpura unique and identifiable. Because these rashes are possibly a symptom of a life-threatening condition, a doctor’s diagnosis is absolutely necessary. After that, they will run some blood tests to look at platelet levels. If ITP is suspected, they may do a bone marrow analysis or a skin biopsy, while screening for allergic purpura (HSP) will involve a urine test. Because purpura is a symptom, letting it go untreated can pose great health risks. For example, both blood clotting and internal bleeding can be life-threatening. Allergic purpura, or HSP, can result in kidney damage if ignored or untreated, and can also lead to severe and potentially fatal bowel obstructions. The best way to prevent these complications is to get to the doctor as soon as you notice inexplicable rashes or bruises that fit the description of purpura. The faster the condition can be diagnosed, the earlier it can be treated and the better off your prognosis will likely be. Purpura itself does not possess any risk factors because it is a symptom of another issue. Conditions that cause purpura generally are not related to lifestyle, so there aren’t really any preventative measures available. Once you’ve visited your doctor and the cause of purpura has been assessed, an appropriate course of action will be recommended. Because spots on skin caused by purpura can result from a variety of conditions, a number of treatments are possible. In some cases, there will be no immediate treatment and your doctor will ask you to simply monitor the situation. If it doesn’t go away or worsens, treatment will commence. On the other hand, if a severe underlying cause is suspected, treatment can begin immediately. Once again, it’s not the rash that’s treated, but rather the condition that is causing the rash. Thrombocytopenic purpura treatments will typically focus on enhancing blood platelet levels. The most common treatment is corticosteroids that help reduce the activity in the immune system and set an optimal environment to grow your platelet count. These medications will generally restore platelet levels in a few weeks. If you’ve already done a few treatment cycles with corticosteroids or unresponsive to them, intravenous immunoglobulin may be administered for a short boost in platelet levels. You could also receive various medications. Medications to treat purpura include “Rituxan,” which helps lowers immune response, or “Promacta,” which encourages bone marrow to produce more platelets. In some cases, the spleen is holding on to platelets and preventing them from circulating in the body. When this condition can’t be improved through medication, you may have to undergo a splenectomy (surgical spleen removal). This will usually occur after a medication cycle attempting to reduce the size of the spleen. If cancer is the underlying cause of the purpura, chemotherapy and other cancer treatments will be conducted. As with any illness related to inflammation, you can always try and complement medical treatment with nutrition. Iron, vitamin B6, and folate may all help restore platelet levels, but focusing on a diet with plenty of leafy green veggies, fruit, and fatty fish may also offer some assistance. If you notice reddish-purple spots on your skin, it could be a sign of a major health issue. If the spots are accompanied by purpura symptoms, it’s advised you book an appointment with your doctor right away for an official diagnosis. The purpura causes can be quite dangerous, so early action is required. “What Is Thrombotic Thrombocytopenic Purpura?” National Institutes of Health, March 21, 2014; https://www.nhlbi.nih.gov/health/health-topics/topics/ttp, last accessed November 22, 2017. “Thrombotic thrombocytopenic purpura” MedlinePlus, February 1, 2017; https://medlineplus.gov/ency/article/000552.htm, last accessed November 22, 2017.